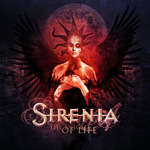 For his fifth Sirenia project, The Enigma of Life, founder and guitarist Morten Veland seems to have settled on a female vocalist as Spain's Ailyn returns to the microphone once more. Female fronted metal bands, especially those of the gothic/symphonic nature, are ubiquitous these days. Sirenia is certainly one of the better ones, even if their sound neither strays from or pioneers a new course in the genre. Essentially, if you dig Nightwish, After Forever, Delain or other bands of this sort, you'll be quite pleased with The Enigma of Life. The Enigma of Life has all the elements that define Sirenia: symphonic, melodic, and sometimes bombastic metal with signature soaring female vocals and guitar solos. The songs This Darkness and A Seaside Serenade are typical of this formula. Yet, over the course of listening, The Enigma of Life seems to have a more accessible nature, a lively almost melodic rock feel. Fallen Angel, Darkened Days to Come, and extremely catchy Winter Land swell with foot tapping rock appeal. Winter Land certainly has commercial, radio-friendly, viability. Having made this assessment The Enigma of Life closes with four songs that could pitch either way. Coming Down and This Lonely Lake couple that rock sensibility with the drama of symphonic metal. Fading Star moves closer to bombastic and melodic black metal with addition of death growls. The closing piece, the title cut, is pure epic symphonic melodic metal. While typical of the genre, the songs on The Enigma of Life are varied and entertaining, having an alluring and unexpected attractiveness. Quite possibly this could be Sirenia's best work. It certainly gives me hope for the whole female-fronted metal band genre. Recommended. While typical of the genre, the songs on The Enigma of Life are varied and entertaining, having an alluring and unexpected attractiveness. Quite possibly this could be Sirenia's best work.